And for more Close-Up photos. 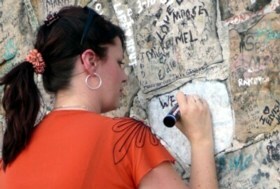 . .
Click here for Sanja Meegin's Graceland Exclusive Photos. WELCOME BACK, once again. August 2006 and it sure is steamy! But where else could your roving reporter be at this time of year? This time I dashed through the wonderful L.A. on the way, just to say 'Hello' to some old Elvis friends and to help shine up our man's Hollywood plaque - which I have to say was in need of a good rubbing. - But who isn't?! Sadly all good things eventually have to come to an, emotional, end. My overall feeling was how quiet this year has been, but this really isn't surprising with the milestone of the 30th Anniversary next year. In fact it was deja vu of my similar feelings back in 2001. As planned I spent an emotional Monday walking with the spirits of Graceland. It is always good to visit but compared to last year I was disappointed, as there were no exciting new exhibits on display. I only hope that they are saving some 'Elvis specials' for next year - I did however get time to take some very nice photos for you all. Spending time in the Meditation Garden was as emotional as ever, with floral tributes being added as we headed to the Vigil. 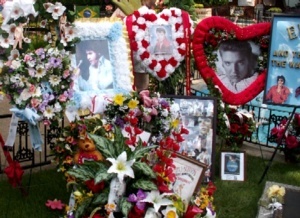 (EIN Note: Click here for Sanja's excellent Graceland photos in detail). Other Elvis Week excitements were running into Elvis' friend (& hairdresser) Patti Parry, as well as Australia's Channel 7 TV crew who were filming a Travel Special on Memphis & Elvis. Tom Williams (the presenter) interviewed me, so all you Australian Elvis fans watch out for my performance coming up on September 25th 2006 on the travel show 'The Great Outdoors' ! With my departure looming all that was left was the emotion of The Vigil before I could say goodbye until next year. Luckily the predicted storms didn't happen (remember them in 2002!) but the air was laced with passion, love as well as that Memphis humidity. As always I lit my candle from Elvis' eternal flame and walked up the candle-lit path, accompanied by Elvis' emotional 'Can’t Help Falling in Love' playing throughout the garden. EPE was originally mentioning fan attendance of up to 10,000 but the number seemed around half of that. It still took hours for a lot of fans to get through those special gates. 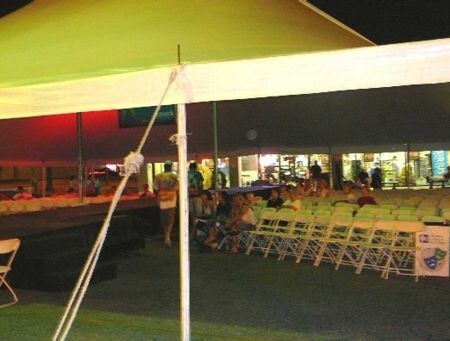 It is always an unforgettable experience that words cannot properly explain, but something that every true Elvis fan should share at least once. - Elvis, thank you for enriching all our lives. Ah, Elvis was singing that song for me last night! But was it about the cocktail or something else?! The crowds have rolled in and we all feel like partying! I let my hair down & whooped it up all night at the Elvis Dance Party and it was awesome. A magnificent event, a fabulous celebration. Everyone was there, and there were lots of reasons to party. 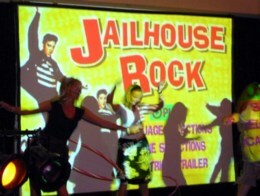 There were hula-hoop contests, best rock'n'roll dress & heaps of door prizes. The DJ was excellent with Elvis playing all night long. I managed to share a few cocktails with both (The Imperials) Joe Moscheo and also Joe Guercio. 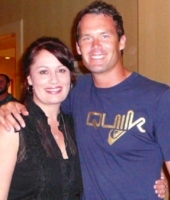 It was nice to see old EPE buddy Todd Morgan who arrived towards the end. 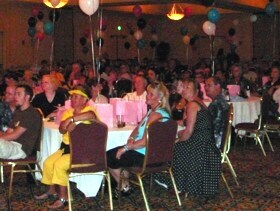 Book your ticket for next year's dance now! - "I'll Be There"
"I was minding my own business. I swear I'll never touch that stuff again"
Tomorrow is a better day to head inside & I promise lots of exclusive photographs. "Babe, you're getting closer, The lights are going dim. . "
Back at The Insiders’ Conference and what a fabulous day it was. Starting with the massive crowd-pleaser of the ‘Bloopers Reel’ from the ’68 Special the atmosphere was on a high. I was ‘girl happy’ but in fact coincidentally actress Chris Noel from Elvis' 1965 movie 'Girl Happy' came on stage to draw the next prize - a massive picture of a 50's Elvis on canvas! 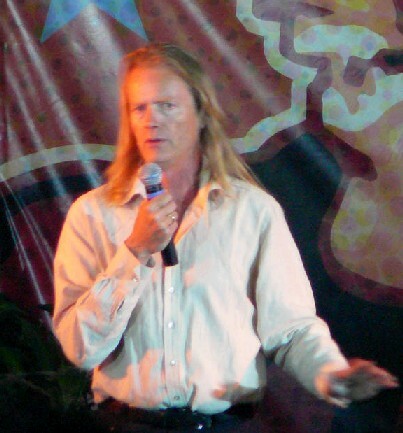 It was good to see Ernst Jorgensen again. (Remember that he was too sick to attend last year). Ernst (Photo right) gave a quick run-down on new Elvis releases for the near future. - The complete ‘Million Dollar Quartet’ BMG release. Now we get to hear Elvis walk in to the session and say good bye as he is leaving and in much better sound quality too. - ‘His Hand in Mine’ Deluxe release. - The ‘1961 Hawaii concert’ – a sensational & important performance that deserves a re-release with upgraded sound. - The 'Song-Writers' double CD with one side devoted to demos and the other side devoted to Elvis' original versions. Although Ernst was not sepcific he did mention 'Teddy Bear' sung by Otis Blackwell and 'Slowly But Surely' by P. J. Proby. - Another Christmas Album. Of course it is a regular money-make but just same songs, new cover! Another real treat was when Angie Marchese from Graceland Archives showed the video footage they took at the Colonel's house! My goodness it was unbelievable. Everything was labelled and filed in order with the utmost precision - he must have had an amazing staff working for him. Things like menus from EVERY Vegas show - and I’m talking hundreds of them in pristine condition. 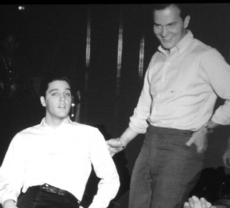 The Col apparently kept a day-to-day record of his entire relationship with Elvis over the years. AND check this out - they found scrapbooks with over 60,000 photographs of Elvis. Of course the video only showed you the outside of the scrapbooks but hopefully we will see what was actually in them somewhere down the line. Also amongst his stuff was every movie script Elvis did, all original studio acetates, audio tapes and signed contracts. And for every award/plaque Elvis every got, Colonel also received one - they were everywhere. You should have been here. 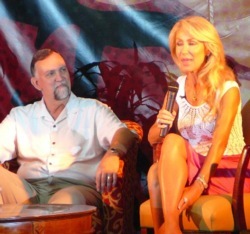 Linda Thompson and Sam Thompson. Another highlight was Linda & Sam Thompson who talked for about half an hour. Linda looks lovely and she didn’t have a bad word to say about Elvis - nothing but praise and how much of kind, generous, wonderful, caring human being he was. She just said how incredibly sensitive he was and also mentioned how much he loved his fans and would just be so thrilled that his legacy is still being carried on by all of us today. It was enough to make one cry. My friend James Burton then came on and spoke briefly for 5 minutes. We of course know him so well and he wanted to mention the James Burton Foundation in Shreveport a charity that raising money for children. Afterwards I talked to him and he mentioned how he is really looking forward to coming out to Australia again in October. After that was the delightful Jordanaire Gordon Stoker along with a look at the new Ed Sullivan TV footage which is a lovely video upgrade - we all wanted a copy now! After passing through Florida for a ‘Clambake’ and a quick top-up tan I arrived to a very deserted Memphis. Lots of Airport security hassles this year of course. Rushed down to Marlowe’s for the Fan Club Meet & Greet. It was great so see so many old friends like Bill Burke as well as Irv Cass (World Champion ETA). It was storming hard outside and the weather has been muggy and rainy, but not really hot like it was last year. 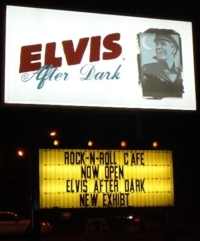 The biggest shock was to see the change at the ‘Graceland Crossing’ which is no longer even called that, but is now "Elvis After Dark". All the shops I loved are gone and everything now is ‘EPE’. They have even closed down 2 stores and made it an EPE display which seems a total waste of space as it appears that they are struggling to find things to fill it. Disappointing to say the least. A new addition is Elvis’ billiard table in the middle of the room! And if you have a spare $100, you are able to play on it for 30 minutes. There is also a golf cart of Elvis' on display in there. But that’s about it, and they were closing at 9.30pm!! In the afternoon I went down to Graceland and the tour line was empty at 2 o'clock in the afternoon! There were only 3 people on the shuttle for the next tour going over to the mansion. Compared to previous Elvis Weeks it seems like a Ghost Town, but of course it will rev up for the weekend. There is another difference as you can also feel Sillerman's presence all around. Apart from all the novelty stores that had cheap Elvis souvenirs being gone - the prices have increased on what seems like everything. Parking was $2.00 in the Graceland Plaza last year - now its $6. Souvenirs prices seem astronomical. 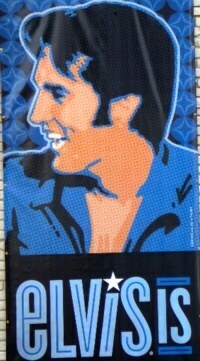 The theme poster for 2006 is pretty ordinary with the slogan being "Elvis Is" - whatever that is supposed to mean!! The first day of the ‘Insiders’ Conference’ had a better buzz. June Juanico (Elvis’ early girlfriend) is such a lovely, lovely lady and was the most interesting part of the day. It was a delight to see some of her home movies (you know the ones - the fishing trip) that she filmed when she was Elvis' girfriend. But, of course, the real bonus was hearing her genuine emotion as she explained them to all of us. They were such innocent days for Elvis. My old friend (Elvis photographer) Alfred Wertheimer was there too. He told some nice stories and of course he has made a nice living from his fabulous Elvis photos but how strange that he never saw Elvis again after 1956. Wertheimer was delightful explaining that although Elvis was still very shy at the time, Elvis really took to him and he actually liked having his photo taken by him. In a supportive move for Elvis fans, the Conference gave away an awesome mountain bike with Elvis written all over it as the prize of the day and even I won a door-prize of Jerry Schilling's new book "Me and a Guy Named Elvis" which I can recommend. Headed down to Beale Street which was thankfully packed. There was excitement in the air - & Margueritas in my glass! Nice to discover that The Hard Rock Café's entire upstairs is all Elvis now! You have to check it out for Elvis’ genuine suits from Fun in Acapulco, Frankie and Johnny (Right) and also the (below) belt from the Red Lion Jumpsuit! - Another night of Rock’n’Roll and the Presley excitement is building up. - But 'it's Midnight' and where are the fans?- Maybe I'm just here too early. 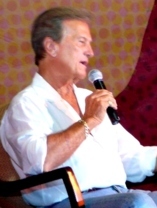 Left: Pat Boone today- Not enough Elvis memories. Right: Elvis & Pat Boone- How could he forget? 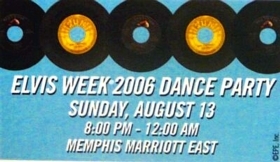 Click to read Sanja's adventures at Elvis Week 2005!